Israeli sources have reported that, on Sunday evening, seven settlers were injured, including a pregnant woman who was seriously wounded, in a shooting attack near the illegal colony of Ofra, which was built on Palestinian lands near Ramallah, in central West Bank. 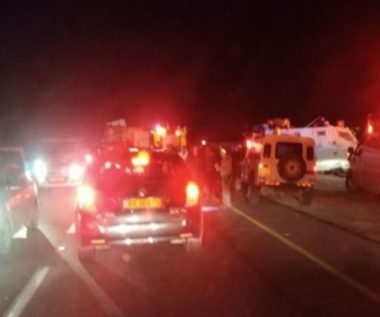 Israeli daily Haaretz said a pregnant woman, 21, suffered a serious injury, and added that two young men, in their twenties, and four teenagers, 16 years of age, suffered mild wounds. The pregnant woman was shot in the upper body, and was rushed to Hadassah Ein Karem University Hospital, in occupied Jerusalem. Physicians at the medical center delivered the baby, who was premature, but is a good condition. The injured woman, and her husband, who was also injured, were waiting for a bus; Haaretz said the two are settlers who live in the area, but not in Ofra colony. It added that the attack was carried out in a drive-by shooting near Ofra, and that the army initiated extensive searches and operations in the area, in an attempt to locate the shooter. The rest of the wounded settlers who rushed to a number of hospitals, including the young man, 21, who suffered moderate injuries to his lower limbs, while two females, and two males, all sixteen years of age, suffered light wounds. According to the Israeli army, the shooting took place from a speeding vehicle, and that the shooter targeted six persons near the entrance of Ofra colony. The army stated that its soldiers, stationed near the scene,fired several live rounds at the car, but the driver managed to escape, apparently unharmed. Back in October of this year, two Israelis were killed, and one was injured, in a shooting attack in the Industrial Zone of Barkan illegal colony in West Bank, and the army is still trying to locate the suspected shooter, Ashraf Na’alwa. The army repeatedly abducted and interrogated his family and friends, in addition to ongoing invasions and violent searches of their homes and property. In mid-October, the army handed Ashraf’s parents a military order for the demolition of their home.